I had all these grand plans for the new year with my blog. And then January hit and NOTHING. I think it’s a combination of snow (too much, too often), the polar vortex (I still think Al Roker totally made that term up), extra days off of school for my son due to said snow and polar vortexes (Mama needs her thrifting time), buying a new computer (damn you Windows 8) and my January obsession with organizing my house (I MUST buy pretty boxes to contain my stuff). Oh, crap. Menopause. Can’t forget my good friend Men. O. Pause. Jeezo peezo, I could do a whole post on that one! So, I have not died or been abducted by aliens. Just been trying to get my mojo back. And since you can not write a post without using a photo (blogging rule 1.452), here is a photo of the chalkware fruit that I bought at the thrift store yesterday. Sure, there’s some chippiness to it, but hey, we can’t all be perfect. And only $2.99 at the Salvation Army. OK, I’m out of here. See you in a few days when I get my mojo back. Or is that mojito back? I think I am feeling almost the same way. I haven’t blogged in a month, not since the cocoa bar!!!! You found a fun chalkware piece tho! Looking forward to you getting your “mojito” back! Pam, can I mojito with you? I wrote a post yesterday that didn’t mention the word menopause but surely could have! I’m right there with you girl. Now that’s a title, Pam! This winter just has me hibernating…I am in thrifting withdrawal. 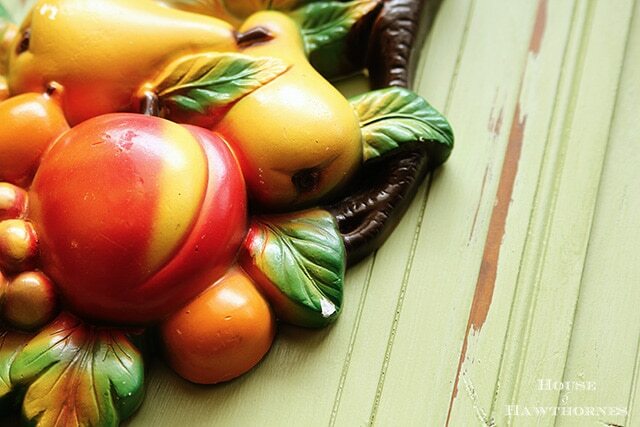 Love your chalkware fruit…that is a big one! And as for menopause…been there, done that…don’t want to do it again. I’m ready for that mojito too! Love that chalkware. I still enjoy my little fruit pieces above my cherry kitchen valance. If your latest find ends up missing, come visit me! I think I would hate windows 8, too. Otherwise, I just hate winter and snow days, aka polar vortex days. Keep warm. Well, I understand the menopause, I understand the lack of mojo after the holidays (I haven’t even finished putting it all away yet) and I understand snow days (though I don’t get those per se down her in rural SW Georgia) but it 17 – 19 degrees on Monday and Tuesday, only got into the upper 20s on Monday, then 30s, then 40s Wed, 50s yesterday and yes, 63 today. Tomorrow? 50% rain and 70 degrees and then back down again next week. We are all going to get the flu and colds with this up/down, up/down weather! At least I am not shoveling or digging out of the snow. I am a ‘yankee girl’ living in the south and know that cold winter weather and the January ‘blues’ well… I am not a big chalkware fan, and especially not the fruit theme stuff but that doesn’t mean its not cute and vintage lovely… just not my taste 🙂 Stay warm with a mojito!! LOL-Well, at least you haven’t lost your sense of humor in spite of everything! Are you going to touch up the chippies on your new piece or use it in all its banana loving beauty? Oh, my! Same here! I was going like a house afire all summer, fall, then Christmas. I made my first cocoa bar…it was a big success! Now, it’s January, living in Illinois got the worst of the snow storm. and now, I am just like a big lazy piece of dough taking naps in the middle of the day, spending way too much time on Pinterst, and in general a big zero! I’m a face painter, and need to get some new faces for my display, need to do some crafting, need to buy some more decorating things at the consignment shop….but instead here I sit drinking coffee and watching Turner Classic movies…I hope this passes soon or I may have to take drastic measures..! Well, certainly don’t get Netflix then, because that is a whole other thing to get addicted to watching! I just checked out your snow photos. You really got hit with it! Yep, it’s the biggest snow storm we’ve had since the ’80’s, 12 inches of snow and then it drifted and then sub zero temps, been pretty harsh….ditto on the Netflix, I know what yoy mean.. I am having a blank time too. I get the blues this time of year and become unproductive. I’m going thrifting tomorrow so hopefully a great find like yours will lift my spirits. LOL- sounds like cabin fever and the winter blahs. Honey, what you need is chocolate and lots of it. Hope you have a good weekend. Warmer weather here and coming at you! Hopefully we can melt before the next one comes in. LOL Your posts are always worth the wait and I feel your pain with Windows 8. I think in this instance it’s mojito. It certainly helps during these times. Nice find at the thrift store. I haven’t been in forever. Too much other stuff going on. Here’s to getting your mojo back. I think we’re all a bit stuck after the creativeness at Christmas time. My mantels are bare and I haven’t been shopping since before Christmas. I’m impressed that you ventured out to the thrift store! 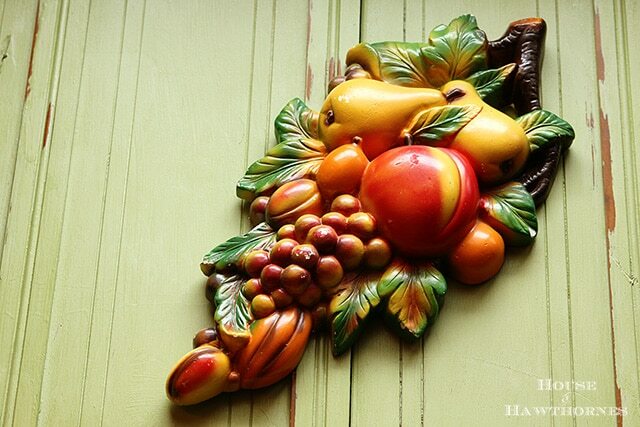 Your chalkware fruit piece is quite pretty, so your efforts were worthwhile! I know how you feel – about the mojo and the menopause!! This time of year with the cold and dark at 5:30 always finds me moving just a little bit slower!! The temps are going to be much warmer this week so I’m hoping it motivates me. Have a great week. I am sorry…not AT you….WITH you. February is right around the corner. Which means NOTHING when you live in the upper Midwest. Haven’t we had a lot of snow? I love it though. After living in the land of rain, moss and dampness green I am so happy to see snow!!! I love the piece of fruit! That is awesome!! I think it’s making you even more of a scream though! Pam, no problemo. I’ll stick with ya. I understand the blues. Christmas always makes me feel bluesy. Is that too honest? Also, I came down with the dreaded H1N1 the day after Christmas (and my husband a few days later), and I’m still not completely over it. So, I’m off my track also somewhat. Sending good wishes your way.